I had run this trail a number of times, but it had been a few years ago. I had never hiked it. A couple of times I had run it while it was wet and the rocks were slippery or at least my shoes were. There were great views of the lake. Directions: From Nashville take I-24 east (about ten miles) to exit 62, Old Hickory Blvd (TN 171 N). The Park is reached in a little less than 7 miles. Along the way the Old Hickory changes names to Hobson Pike. Turn right with good signage (the first right after crossing Percy Priest Lake.) The Park Office is the first right. The Park may also be reached from I-40 by taking the Mount Juliet exit (226) and heading south on Mt Juliet Road, continue straight eventually it becomes Hobson Pike. From the Park Office to reach Bakers Grove Parking Area and Trailhead: travel .70 miles north (away from the lake) on Hobson Pike to Bakers Grove Road. Turn left on Bakers Grove, go a sort distance and turn left again at the "tee." The parking area is at the end of the road. All the turns are well signed. Information on the Park is available at the Park Office. Water and restrooms are also available in the Office area. 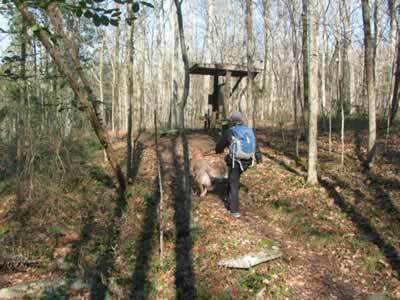 No facilites are available at the trailhead. Leaving the trailhead, hike down the old road for a tenth of a mile before turning right. Cross a small bridge and pass a sign indicating that you are hiking on the Day Loop Trail (and the Volunteer Trail.) 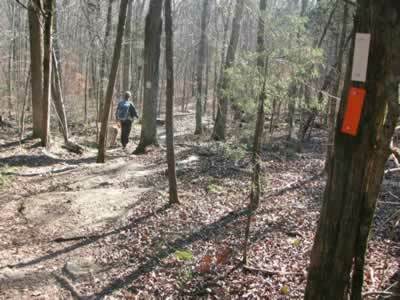 The Day Loop Trail uses orange blazes and the Volunteer Trail uses white blazes. 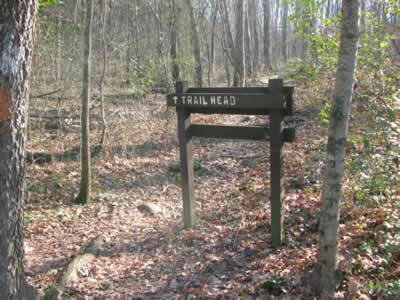 Both colors of blazes are used on this shared section of the trail. 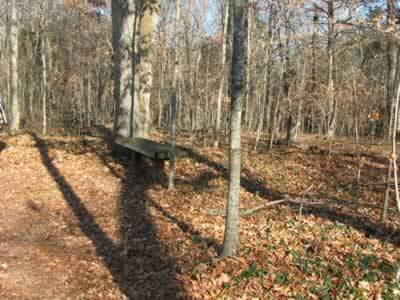 After climbing for a tenth of a mile to a small rise, a bench is available. Continuing the trail crosses a bridge in another .15 miles. Just beyond the bridge the trail passes through a rock garden. 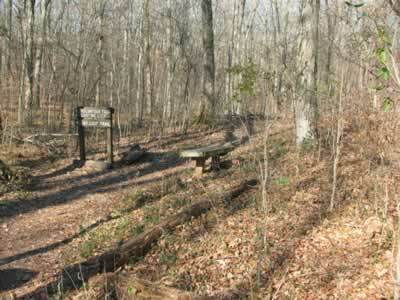 At .55 miles from the trailhead the trail reaches a junction and a bench. 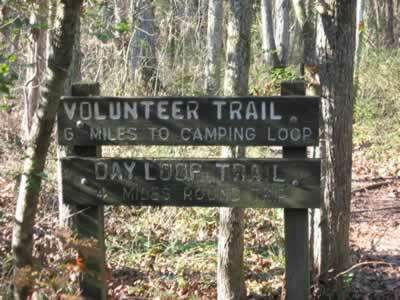 The Volunteer Trail (white blazes) goes right and the Day Loop (orange blazes) is directed to the left. The .55 miles just completed will be repeated on the return. Turning left, a bench is reached in .10 miles. 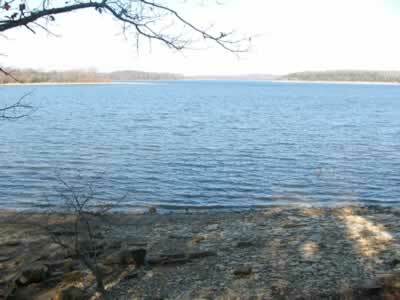 Glimpses of the lake can be seen to the left as the trail continues to follow the shoreline at a distance. The trail climbs a bit then descends as it leads toward a point on the shoreline. 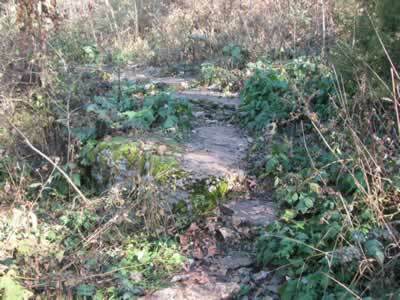 Another easy climb passes through a rock garden with sink holes as it climbs a small mound. 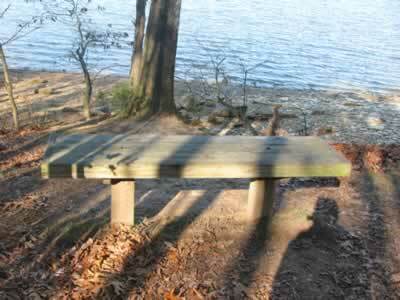 Finally the trail strolls to the water’s edge with a bench waiting for all hikers. This grand view is 1.25 miles from the trailhead. From the point, the trail continues closer to the shoreline but still curves away. About a half of a mile from the bench, the trail rises above a small cliff overlooking the water. The trail was overgrown in this area. The main Stones River channel runs below the cliff. As the trail follows the top of the cliff a few more excellent viewpoints are passed. Leaving the overlooks after .15 miles, the trail goes around a north facing knob. A bench is passed in a half of mile. From the bench the trail goes around a drainage with sink holes and then joins the Volunteer Trail again after .30 miles. 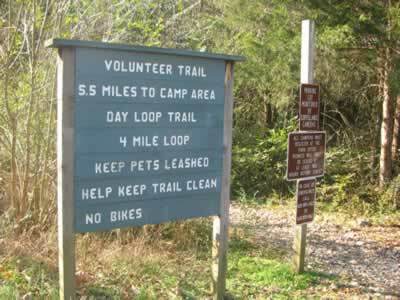 The Volunteer Trail goes to the left. The trail kiosk located just a few feet down the trail, is a good place to take a break. 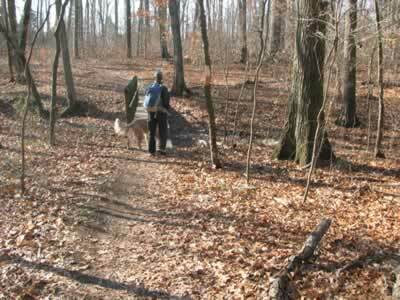 Continuing straight the Day Loop Trail joins the Volunteer Trail as it climbs a hill (100 foot in elevation). 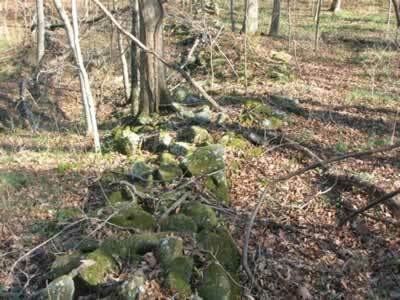 An old stone fence is passed in .15 miles. 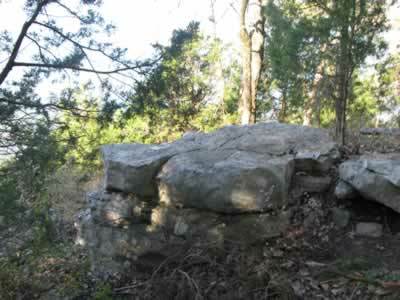 A bench is reached in a short distance near the top of the hill. 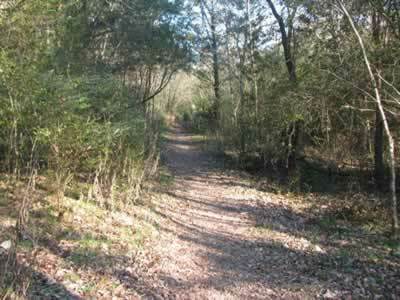 The trail crosses the top of the hill and then turns left as it begins the descent. The trail descends steeper as it weaves through exposed limestone. From the bench at the top of the hill it is a half of mile to return to the first junction of the two trails. Repeating the first leg of the trail, it is .55 miles back to the trailhead. The trail is 4.0 miles long.